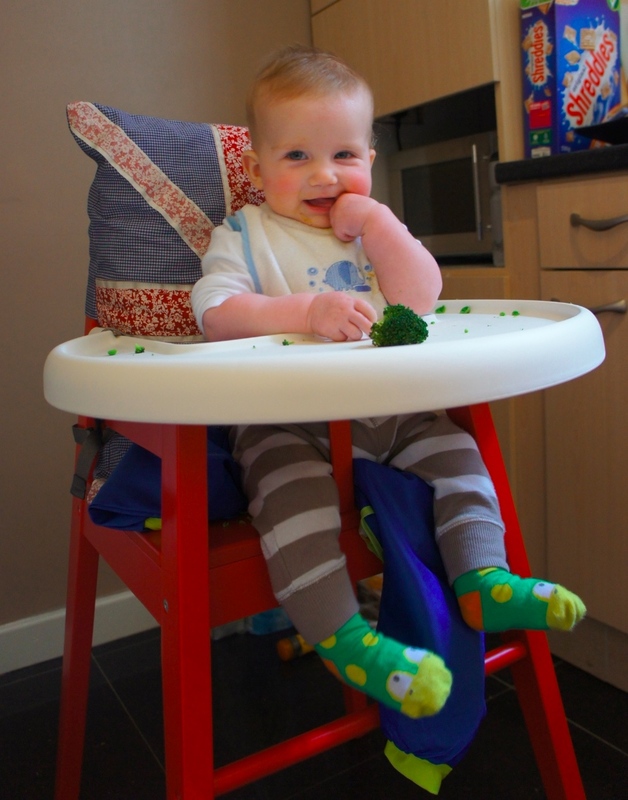 Yesterday I FINALLY got Reuben a high chair. I feel like a terrible person because a) I’ve been feeding him either on a bouncy chair or in him bumbo (both of our preference is the former) and b) for that reason I’ve not been giving him hardly any finger food. The mess, oh the mess! 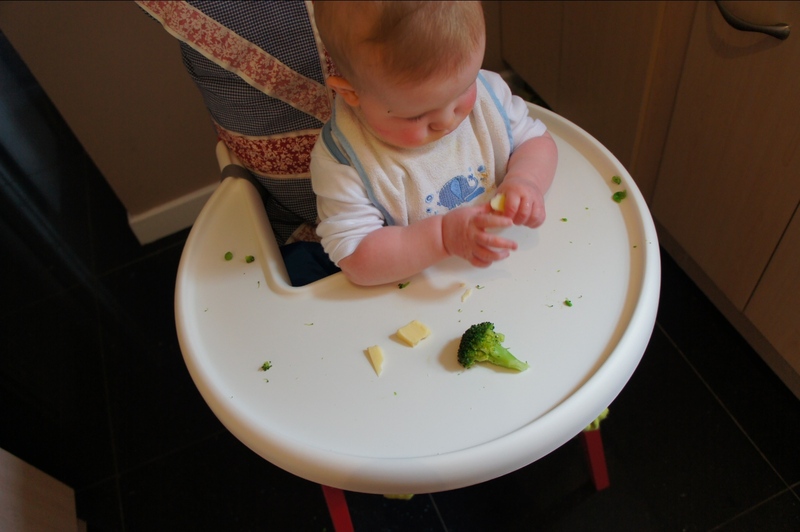 So now we have a high chair, today we’ve been trying out some baby led weaning recipes. 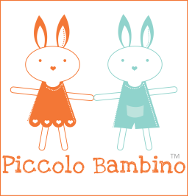 Before I get onto that though…just because I haven’t blogged about it, does not mean I’m not ‘being Annabel Karmel’ – in fact I have been positively channelling her. For the past week and a bit I have been a baby food making machine all whilst working out AND I even did a bit of cleaning! AK would be proud of me. 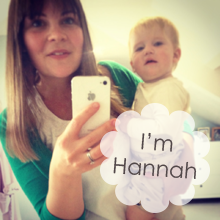 I’ve been hash tagging my progress tweets with #beingannabelkarmel – please do tweet me your attempts at baby food prowess and use this hash tag so others can see! I have to say, I’m actually really enjoying it. 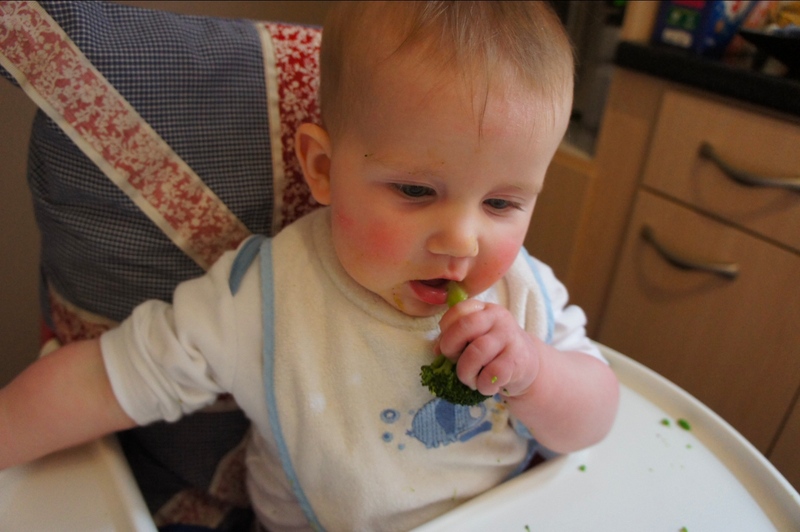 Much like Ellie said in her comment on my first weaning a baby post, I’m enjoying weaning a lot more than just milk feeding, which in general I never got the hang of – when to do it, how much, etc, etc! So food is good. Breakfast, lunch, dinner. Got it. 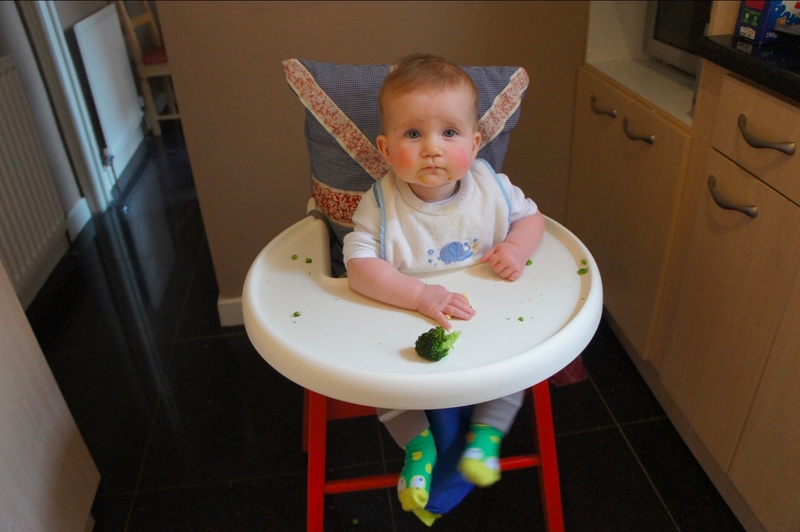 I’ll do a progress report soon, but today I wanted to share some photos of Reuben in his new high chair, sort of eating. Because in my humble opinion, he looks adorable!! What I know of baby led weaning is you’re meant to give your baby things on a tray and let them ‘play’ with it. Smear around, mash into their hair, eyes and ears, and throw on the floor. During this process they might eat some. I’m not overly keen on the idea of this kind of mess – mud, yes, paint, yes, food, no. But it’s good for hand eye coordination, it’s simple, and teaches your baby to chew so we try it, don’t we? Previously we tried the Nuby Nibbler feeding net. I like the Nibbler, this is my kind of finger food. You put food in the net, and it contains the mess! Reuben knew exactly what to do with it too – here’s a vine (i.e. 7 seconds!) of him on his second attempt at using it. Piece of cake (well banana). Today as a first attempt at baby led weaning, Reuben had peas (which he smeared around and pushed to the corner of his tray, and then threw on the floor), broccoli (which he picked up, studied for ages and did put to his mouth but I’m preeeeetty sure none actually went into his stomach, and then threw on the floor), a bit of cheese (which he poked and squished, and then threw on the floor), and some banana (which he mashed about the tray, put in his mouth, and then threw on the floor). It was fun though! 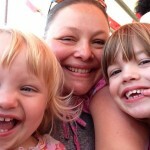 …I’m not quite sure I’m ready for that kind of mess yet though so let me know how you get on! I always love your chats on Facebook and try to pop over here when I can. Ha! Thanks Mama H…That’s it now, he has to be involved – a spoon and the plate MUST be in front of him and provided that’s the case, he will let me sneak food into his mouth as he pushes things around not quite getting anything on his spoon, which he then puts in his mouth. Soon, I won’t be allowed to do any sneaking!